Capitalizing on his knowledge, skills and experiences in management and business transformation, Dato’ Dr. Othman Haji Omar is now helping business start-ups, young entrepreneurs and conventional businesses owners to rebrand, rejuvenate, synergize and systemize to leapfrog their business to success at KL entrepreneurs Experience(KLEX), Entrepreneurs Bizhub and Empire Business Club. 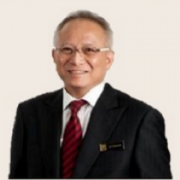 Currently, he is the chairman of Executive group for KL Entrepreneurs Experience Sdn Bhd (KLEX) and other KLEX Group subsidiaries, President of Empire Business Club, Executive Chairman of KLIX Academy (M) Sdn. Bhd, Board member of University Institute of International and European Studies (UNIES) South East Asia and Co-founder –deeds.com.my (social/CSR online platform) and former general manager of Selangor State Development Corporation (PKNS). On the 1st of October 2018, he was then appointed as the Director General of FELDA. In addition, he was one of the board members in FELDA and FGV Holding Berhad. Dato’ Dr. Othman Haji Omar holds a Doctorate in Business Administration from the University Institute of International & European Studies (UNIES) Krekerde, Netherland / University of Georgia (Tsibli, Georgia) 2016, International Executive Masters in Business Administration (Strategic Management) , Paris Graduate School of Management, Paris, France, Bachelor of Engineering (Civil) University of Tazmania (1984) and was a former student from Maktab Rendah Sains MARA, Seremban, Negeri Sembilan (1972-1977).